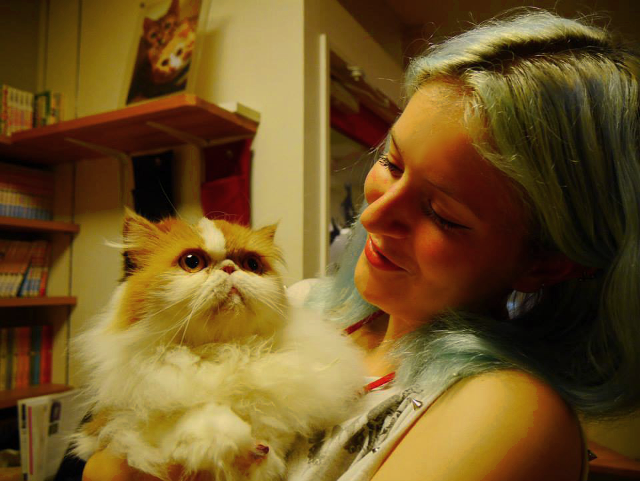 So in my first few weeks in Tokyo I knew one of the first things I wanted to do was visit a cat cafe. As we don't have them in England (although I think one may have opened in London now?) this was a pretty exciting idea for me, especially as I don't have cats at home! I have now visited two so I thought I'd share some pictures of my experience and what it's like to visit one in Japan. First of all depending on how nice the cafe is it can be a little on the pricey to visit, you are given a tag to wear around your neck when you enter which says what time you arrived - then you pay when you leave. So it's worth keeping an eye on the time if you don't want to pay X amount. 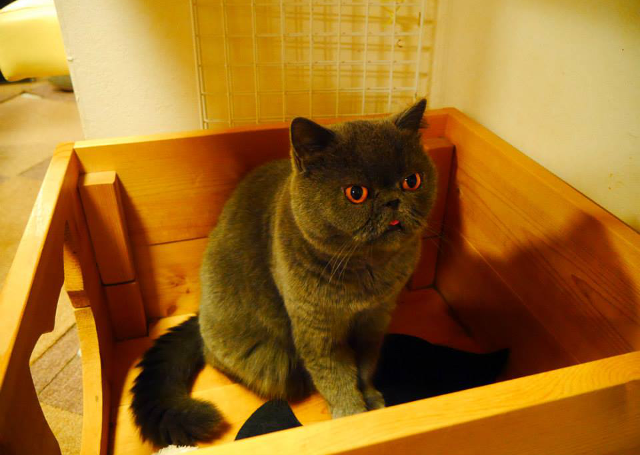 When you go in as well you take off your shoes and put on some slippers provided by the cafe, this a Japanese custom anyway to take off your shoes but I guess this especially applies in cat cafes to keep things hygienic for the cats. You'll also be asked to wash and/or disinfect your hands using hand sanitiser. While this is again a good hygiene idea I think it puts the cats off you a little? Whenever I meet a cat I always extend my hand for them to sniff so they can 'read' you or whatever haha but I guess using hand sanitiser etc will get rid of all your smell and make you smell a bit odd to the cat. The staff may also give you a brief list of rules, things like 'please don't pick up the cats' (this didn't apply in both the cafes I visited though), and I also got 'please be nice to X cat *shows picture* as he is a bit nervous' (why you would put a nervous cat in a cat cafe environment I have no idea). 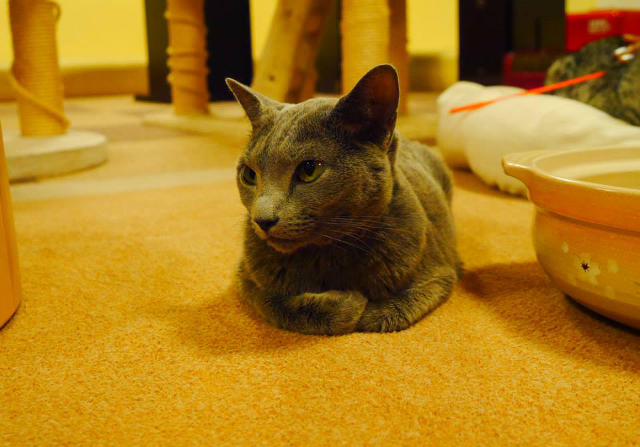 I haven't actually bought any drinks/snacks in the cafes I've visited so far but you can order from the staff in the cafes, and also usually you're able to order small snacks/treats for the cats (which seems necessary to get their attention). 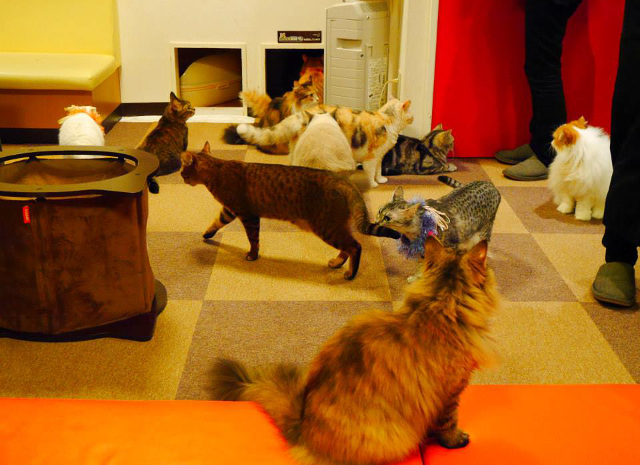 Cat cafes are fun to visit but as a warning be prepared to be completely ignored by the cats. 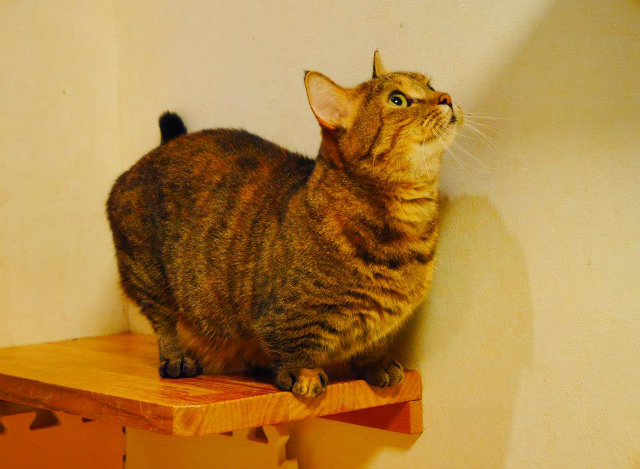 They get a constant stream of visitors each day and are often in a small space with a load of other cats which naturally is going to equal uninterested and grumpy kitties. 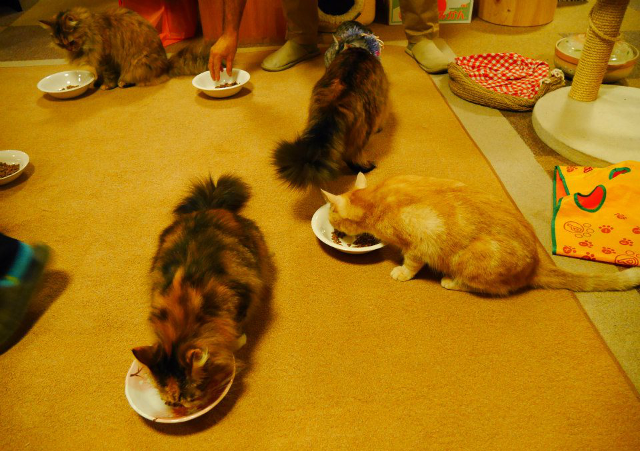 In the first cafe I managed to get a purr out of one cat, and another (the slightly derpy looking one I'm holding in a picture above) paid my friends and I attention at feeding time as it insisted on only being fed by hand so we could feed it - but the rest literally don't even acknowledge your presence. This means no reaction to your stroking them at all, and they will not play with you or even show any recognition of a toy being waved around. I'm guessing this is from over stimulation of the cats, and quite a lot of the time the cats would jump onto high shelves or cat jungles to sleep and be out of reach of people - or sit on a windowsill and gaze out of the window longingly. It can seem quite weird if you are used to meeting house cats who will pay you attention or at least react to a piece of ribbon being darted around in front of them - but I guess for Tokyoites who can't have pets in their apartments it is nice to spend an hour or so reading manga and hanging out with some kitties. P.S All photos in this post bar two are taken by my friend Kaori, so all credit for the excellent photography goes to her! That is so crazy and interesting! The cats are so cute! And I love your hair! 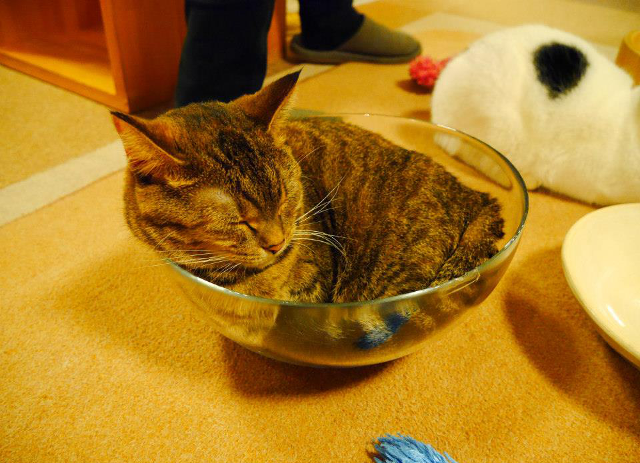 Aww cat in a bowl. :3 I've developed a strange fondness of cats over the years. I can't deny it, they're so cute lol. Aaah, this is so cute! 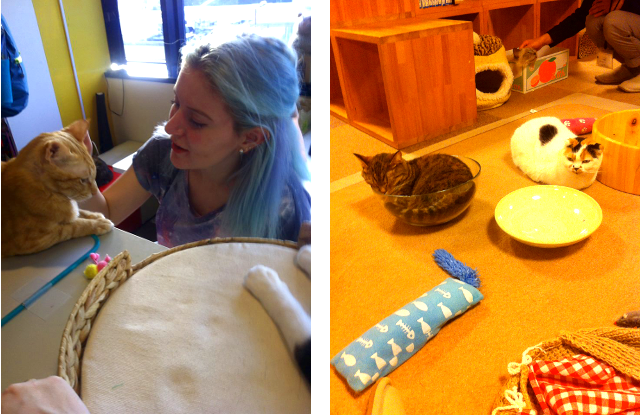 We have a cat and dog cafe in Brighton, so yep, the trend has made it over to the UK!